Russia is a nation that has always been blessed with creative minds, whether it be literary giants like Fyodor Dostoyevsky and Leo Tolstoy, artists such as Peter Carl Faberge, composers such as Pyotr Tchaikovsky, or the military genius of an Aleksander Svechin or Aleksander Suvorov. Russia also has been blessed with the work of innovators in military equipment, such as Mikhail Kalashnikov, who created the world-renowned AK-47. Russian Chief of the General Staff Valery Gerasimov noted in March 2015 that the military’s main tasks are to maintain the combat readiness of the Armed Forces and to ensure the Russian Federation’s defensive capability. Russia’s military heritage will assist this process tremendously. Combat readiness includes updated strategic thought, new equipment revelations, and future-war projections. Defensive capability includes not just protecting Russia’s territory, but also the security of the nation’s national interests and conduct of geopolitics. Capturing the essence of these developments is the goal of this book. In the process a few templates for understanding Russian military thought and actions are offered for further consideration and use. The work is divided into three parts. They address Russian methods of approaching strategy, future war (focusing on new weapons and organizations), and geopolitics. All three are important for foreign analysts to consider when attempting to predict the vector (s) in which Russian military capabilities and actions are heading. It is vital to remember that events that have transpired over the past 25 years have greatly affected Russia’s view of the world today and its strategic thought. Both the military and President Vladimir Putin’s colleagues in the Russian security complex are keen to overcome what they perceive as feelings of national humiliation and insecurity that they say were imposed upon them by the West. Part One of this book contains three chapters. They are focused on the personality of President Vladimir Putin, the development of Russian strategic thought over the past several decades, and contemporary military thought on the use or non-use of force, to include how Russian military officers think. Chapter One provides details on how Putin thinks and how he has been affected by specific issues. Ideology, politics, and military issues affecting his decision-making are discussed. Included in the assessment are several thoughts from some US and Russian specialists with key insights into political thought in Moscow. Chapter Two represents a detailed look at the development of Soviet and now Russian military strategy. The chapter examines strategic thought from the time of Svechin to the present, highlighting, in particular, those elements of strategic thought that continue to influence how forces will be used even today. 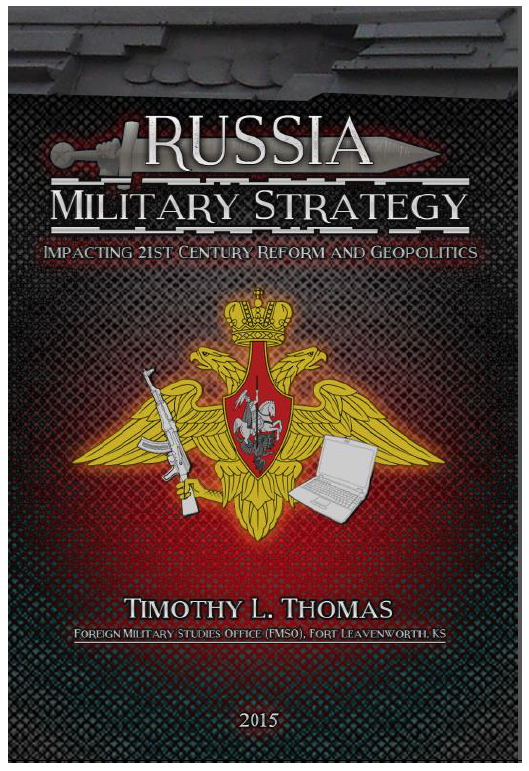 Chapter Three offers a look at how Russia utilizes indirect, asymmetric, and nonmilitary operations, as well as how this differs from most Western interpretations of the General Staff’s use of strategy. In particular, the chapter examines how Russian military officers think and offers commentary on cross-domain deterrence thinking in Russia, which is a topic usually discussed only as a nuclear issue. Here several other potential adaptations of deterrence theory are reviewed. The chapter offers a differing view than some on the issue of hybrid war as a Russian concept and ends with a look at Russian reflexive control theory. Part Two examines Russia’s preparation for future wars. Included in the discussion are new military equipment and aerospace developments, future-war organizations, and digital expertise. Chapter Four deals with several new items of equipment that are now in the Russian inventory, including an extensive look at Russian unmanned aerial vehicles and electronic warfare equipment. Chapter Five is dedicated to the new Aerospace Force and the Strategic Rocket Forces. Defense Minister Sergey Shoygu has stated, “Their creation was prompted by a shift of the ‘center of gravity’ in combat struggle to the aerospace sphere.” The discussion includes the rationale behind Russia’s decision to integrate the Air Force, Air Defense Forces, and Space Forces into an Aerospace Force and to declare aerospace a new theater of military operations. The continued development of the Strategic Rocket Forces is covered, since it has found new impetus from the strategic guidance of President Putin. 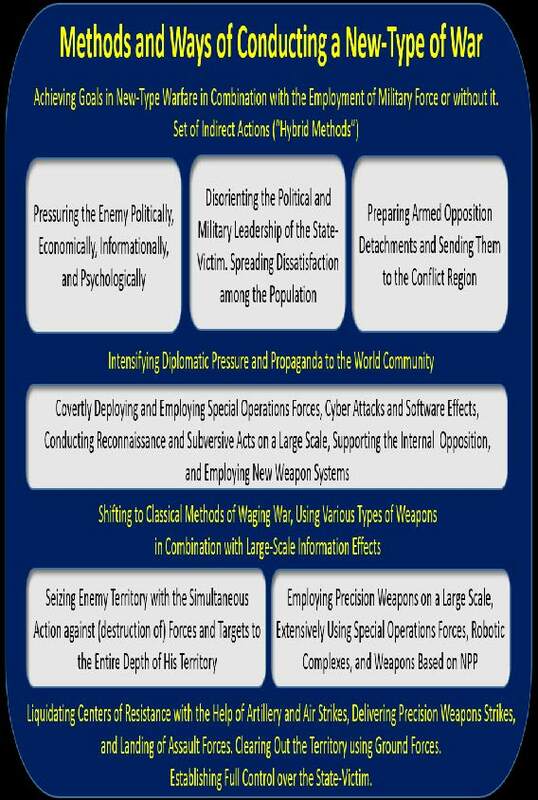 Chapter Six considers several organizational aspects of future-war thought, including equipment under development, organizational and doctrinal changes, and future-war thinking. Equipment under development includes robotics and laser research. Organizationally there is a look at Russia’s new science companies and the Advanced Research Foundation (the Russian military’s DARPA equivalent), followed by a summary of several articles discussing the future contours of conflict and the changing character or war. Chapter Seven discusses Russia’s cyber thinking and organizational development. This includes a review of a Russian-authored cyber book, recent cyber developments in Russia, treaties that Russia has made with other nations, and several policy efforts directed by the Kremlin and the Federal Security Service (FSB) to monitor cyber compliance. A section on military thinking on cyber issues is included, along with Russian efforts to control the international cyber environment. China is a main partner of Russia in this regard. Part Three is an examination of the application of military power and strategy to Putin’s geopolitical goals, specifically as applied to military operations in the Arctic and Ukraine. Chapter Eight investigates the ongoing militarization of the Arctic. The two goals of the military in the region appear to be to establish an overarching monitoring capability and a quick response, powerful military deterrent. Russia has continued to improve its military presence and infrastructure in the region. The buildup includes two light brigades, two airborne divisions that are on-call, new Borei- and Yasen-class nuclear missile submarines, rebuilt airfields, and new aerospace defense units. Meanwhile, Russian administration officials are working feverishly with the United Nations and other organizations to establish legal claims to the Arctic. Putin has made the Arctic a region of his personal interest, noting that the Arctic has been under “our sovereignty for several years. This is how this will be in the future.” This does not bode well for the future of the Arctic’s peaceful development. Chapter Nine discusses how and why Russia became engaged in the conflict in Ukraine, to include the interventions into both Crimea and eastern Ukraine. Russia’s strategy and use of new concepts (new reality, self-determination, use of surrogates, nonmilitary issues, indirect and asymmetric thinking, etc.) are examined. The end of the chapter focuses on Russian actions in Crimea, as it appears Russia is doing one of two things there with its massive military buildup: either it is ensuring that Crimea can never be given back to Ukraine due to all of the military equipment it now has stationed there; or it is preparing a bridgehead from which it can launch a pincer operation against Mariupol or advance quickly on Odessa or Transdniester. Chapter Ten provides conclusions drawn from this study.